I Made It! Edible Bread, Finally. Thank You Mark Bittman. In 2006, Mark Bittman of the New York Times wrote the ground breaking article “No-Knead Bread” in collaboration with Jim Lahey of Sullivan Street Bakery. Since then, I and a few thousand other people became obsessed. While all the other thousand people were very happy as they expressed their ecstasy in the blogoshere, I was miserable. Over the last three years, I must have tried this recipe 30 times. When the recipe says “at this point, your dough should become double”, it never happened to me. Most of the time, it shrank. I tried everything. Bought special instruments to measure the 1/4 teaspoon of yeast, changed yeast, used cold water, hot water, different kinds of flour. The bread I made over the past three years always looked good, but it was inedible. There were no teeth strong enough to attack the stone hard bread. When I served it to my friends, they thought I wanted to terminate the relationship or send them away to the dentist. But then, the light! The other day, I found another and more recent (2008) article by the same Mark Bittman. It is “Faster No-Knead Bread“: it only requires 4 hours’ rising (instead of the 14-20 hours of the original recipe) and it uses olive oil. I tried and it WORKED! As you can see from the picture, it looks magnificent and it is very good, too. I am so proud! If I could do this, believe me, you can do it, too. Next Post How Much Salt in your Salted Capers??? I started making this bread a couple weeks ago and have made it about 6 times. 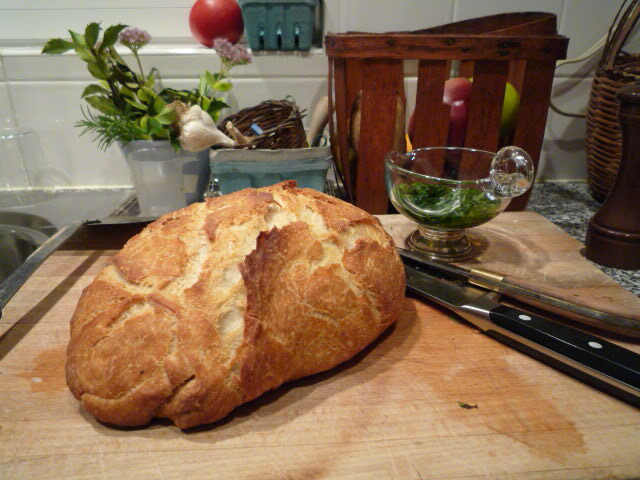 Results have been amazing – it’s the best bread I have ever made and certainly the easiest. I cannot imagine what this poor baker is doing wrong. Today I am going to mix up the whole wheat version. ciao Sara. i have been experimenting with whole wheat flour, also. in my kitchen, bread with all whole wheat flour does not rise and becomes too hard. my best result, so far, is 2 cups white flour and 1 cup whole wheat. let me know what happens in your kitchen. – good idea about adding water. this might make the difference. – semolina in the towel. what semolina? i guess i still don’t have the terms right. i thought semolina was flour. anyway, i don’t use the towel in this recipe. i mix in a bowl where the dough should rise, then i put it to rest for 15 min on the oiled marble counter. i don’t use any more flour. Pingback: Petra Flour, Stone Milled by Molino Quaglia!